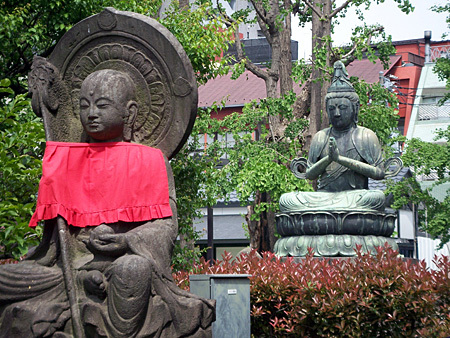 Here are a couple of statues from the temple grounds. 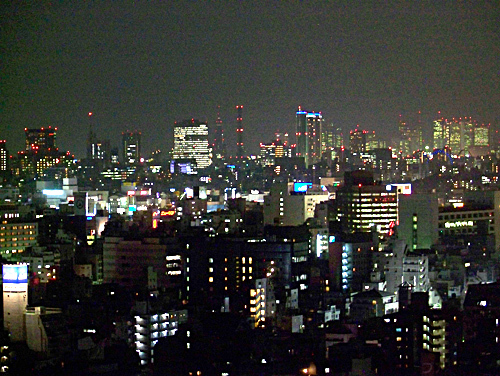 Here are a couple of shots from our hotel window. City as far as the eye could see! 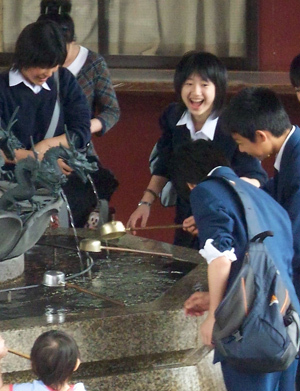 At every Shinto shrine, there is a little fountain with dippers. 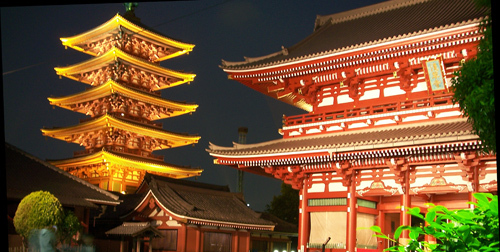 You are supposed to dip water and ceremoniously splash it on your hands, and rinse out your mouth before entering the shrine grounds proper. 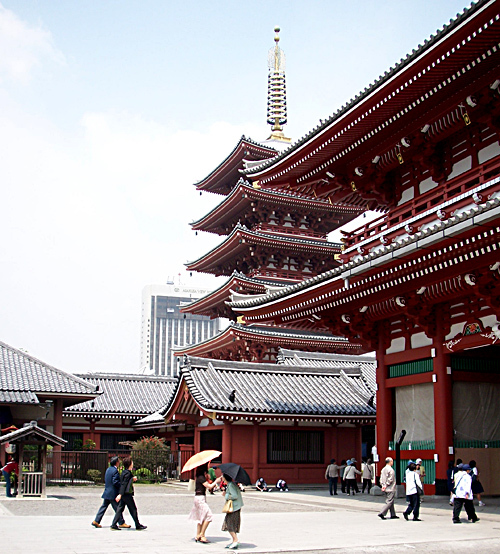 The dippers, seen below in the hands of some solemn shrine visitors, are called Hishaku. 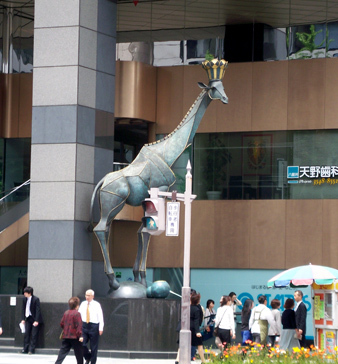 We know they are called Hishaku because we searched and searched for them at shops. The girl at the hotel had no idea what they were called (we drew her a picture) but her manager told us. 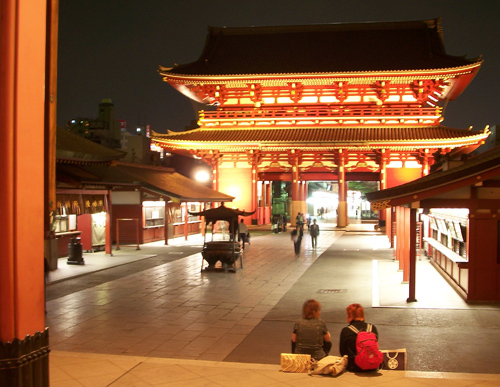 There was a famous restaurant store street near the hotel � Kappabashi Dori. They sell restaurant supplies, including the plastic food that sits in display cases and serves as a menu for illiterate foreigners. 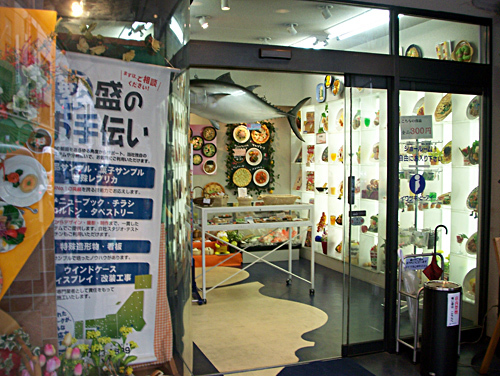 Here is a shop where they sell plastic restaurant food. Here is what happens when plastic food makers get weird. 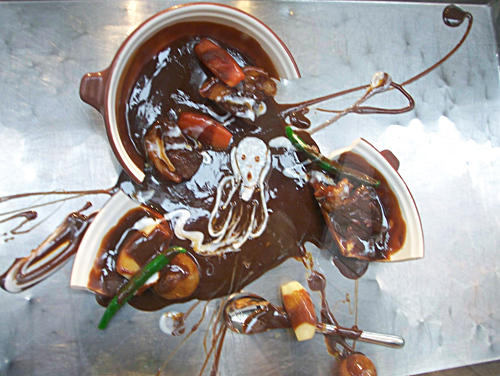 We didn't go to Kappabashi for the plastic food, though. 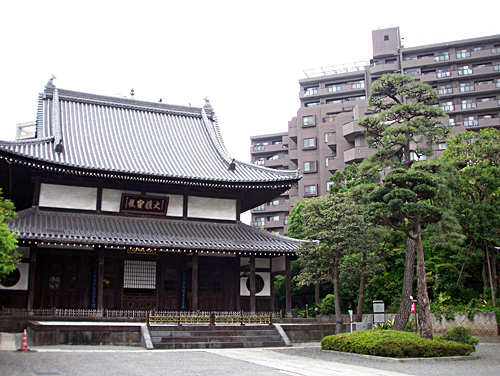 We went in search of Hishaku. Asking around -- and it is surprising how much you can convey with a single word of Japanese -- we finally found a store that carried them. 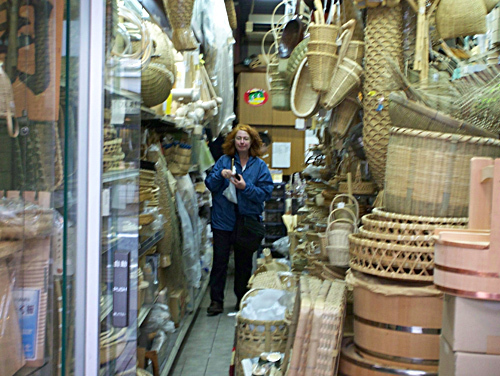 Here is a shot of a lady who has just purchased an Hishaku. We took the shinkansen (bullet train) from Tokyo to Shin Osaka for Eli's Osaka seminar. Here is a shot of Mt. 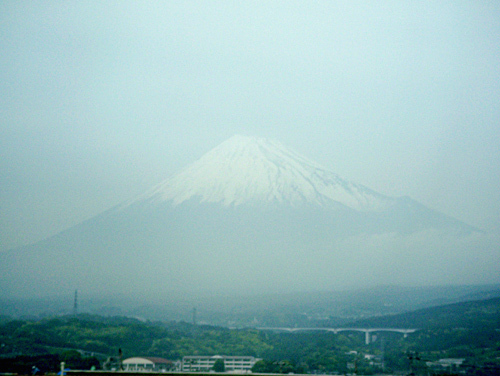 Fuji out the train window. 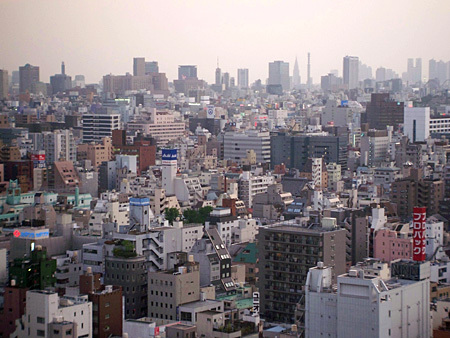 You get the idea that zoning laws aren�t what they are in the states. A lot of juxtaposed buildings that look kind of cool. Here is a house from an earlier era nestled between apartments. There are temples sprinkled everywhere. 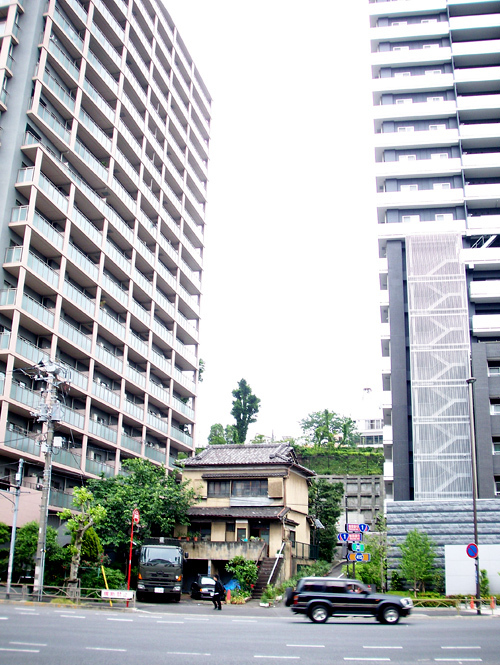 Here is a random one from near our subway stop by the Miyako hotel. I usually walked Eli to class then went off on my own while she taught. 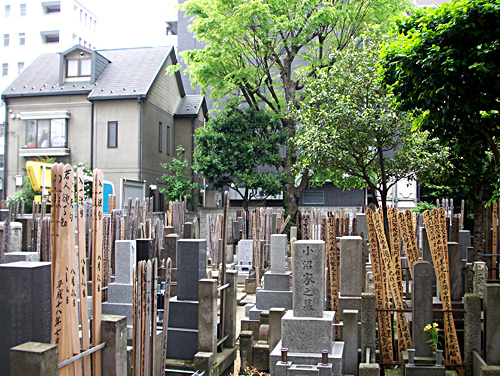 I poked my camera over a stone wall to get a shot of this suburban cemetery. Near our hotel was this famous landmark. 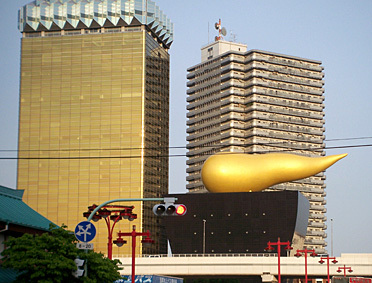 It is supposed to be either foam or a flame atop the Ashai beer hall building, a building shaped like a Japanese beer cup. The locals call it the �golden turd�. 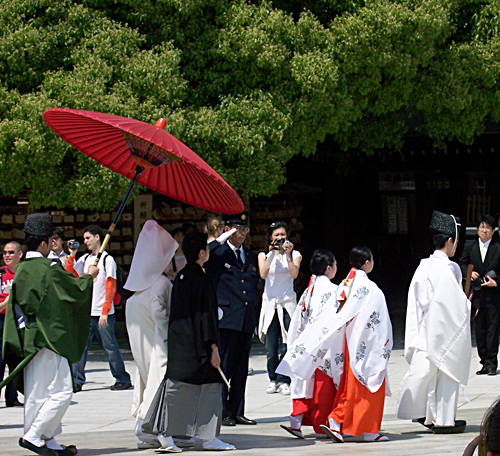 Here is a shot from a Shinto wedding we saw at the Meiji Shrine. Don't ask ... don't tell.